“Costa Crociere” is the only company that offers religious assistance to passengers and crew (provides a chaplaincy). Fr Giacomo Martino, born in 1964, has spent six years as a chaplain on Costa Crociere cruise ships. Although it would seem that (Mediterranean Shipping Cruises) has the same intention, i.e. the provision of chaplain; up to now Costa Crociere is the only Italian company that offers religious assistance to its passengers? `To the passengers, yes, but my parish was made up of many more people than the fleeting passengers, it was made up of the thousand and more people who make up the ships crew who are my parishioners for months and months on end. Peoples of many races and religions, Slavs, Filipinos, Indians and Italians who share with me their pain, their joy, their fears and their nostalgia for their homes and families. How many years have you spent at sea? Around five years and a half. This length of time especially as a chaplain on ships plying the Atlantic, gives you the chance to build up an ongoing true relationship with a crew of 1,100. No, it is very different; you cannot escape from the ship, everybody is living together for months on end. It is difficult for the crew to put down roots as they will often find few familiar faces on their return to the vessel after their leave. Their only human link with their past life onboard is the priest. In the middle of the sea, it doesn't matter whether they are a Muslim or a Buddhist, seafarers of all denominations, all faiths or no faith turn to the priest when he or she needs a word of comfort and practical help. The chaplain is the person helps them to contact their families, to carry messages and the mail, to announce the news of births and deaths, the good and the bad news. The crew members whose contracts last at least 8 months come from every corner of the world. They have left behind a family, often a pregnant wife and when the seafarers returns home the baby is already born. Then, of course, there is the other parish; the passengers. There are a thousand stories to tell of that ministry. There are those who come to the chapel out of curiosity and then decide to stay. There are those who have left sad situations back home and ask the priest for advice. The duty of the priest is to seek out all the passengers; it may be the multimillionaire who could be the loneliest of men, convinced that whoever approaches him only desires his money. However 90% of my time is devoted to the crew of which only a small number are Christian. Life onboard is very different from the one ashore. Terms like “ecumenical” or “interfaith dialogue” at sea are not just words written in a report, at sea they are realized. You cannot imagine any other environment where Serbs and Croats work side by side, Hindus coming to Mass or Muslim crew only trusting the priest. Sadly, on the new Costa Crociere vessel `Costa Marina” no chaplain has been appointed and on the `Europa' they not only do not have a chaplain but they did not provide any space for a chapel. 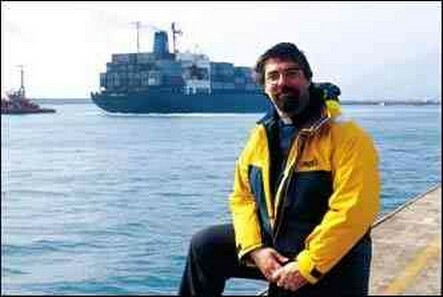 I hope that Costa Crociere will change their minds regarding the appointment of a chaplain on the “Costa Marina”. The company have intimated that a chaplain will be appointed in 2 or 3 months time. The Vice President of Costa Crociere has assured me that the company have reversed their decision on the chaplaincy/chapel. Is life at sea, hard? Yes, very hard, I have been onboard vessels for up to 11 consecutive months. When you sign off you can emphasise with the physiological effects experienced by the seafarers as he or she trys to connect once again with the reality of life ashore. Your realize that your friends while you have been away have led their own lives and you surprised that they are not all them to await your return. The most painful thing is for so many fathers whose children do not recognize them and start crying as soon as they see them. Is there someone that you will not ever forget? I remember a big muscular seafarer working in the engine room. He didn't wish to see me. He used to say “Priests in the engine room are bad luck!” Every day for many months paid a daily visit to the engine room. When we both signed off, we looked at each other, he dropped his two suitcases and without saying a word he ran over to embrace me which left me deeply touched. That incident brought home to me the fact that I must go to look for people wherever they are. What kind of person is a seafarer? A sad man, a fatalist. When he or she leaves home they know that anything might happen. It is not true to say that the seafarer sees the world; the seafarer sees only the wharves. You have now left the sea? Yes, but now my ministry is in the Port of Genoa, every day at the disposal of any seafarer that may need my help.